A date for your diary especially if your have small children. 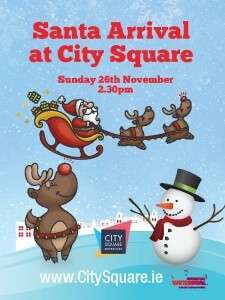 Santa will arrive in City Square at 2.30pm n Sunday 26th November. The party starts from 2pm with a live DJ playing lots of Christmas songs with games and giveaways. Make sure to see the giant Christmas Teddy and dancing Christmas tree.